Consider again, that dot. That’s home. That’s here. That’s us. Astronomer and philosopher Carl Sagan writes that from an early age, his parents instilled in him a sense of both skepticism and of wonder. He has said that the coexistence of those two “uneasy cohabiting modes,” more than anything, prepared him for a life of science. 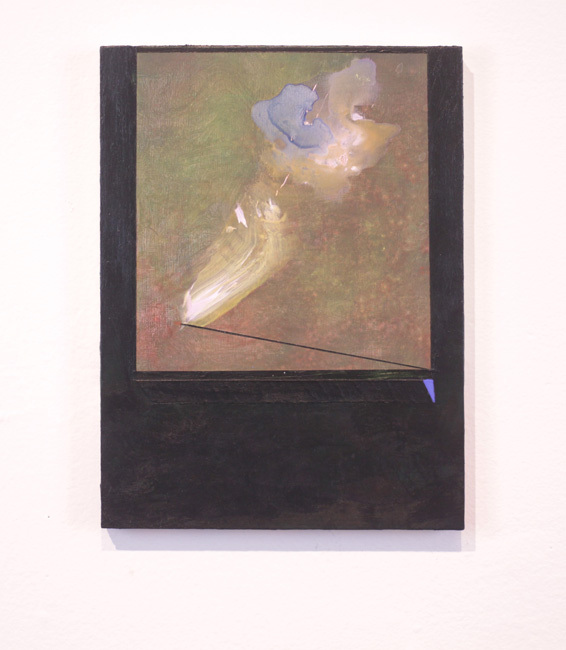 A show that just passed through Space 1026 embodied these two precarious modes most eloquently – a skepticism of and wonder in space, the visible, and the known. Consider again, that dot. That’s home. That’s here. That’s us. 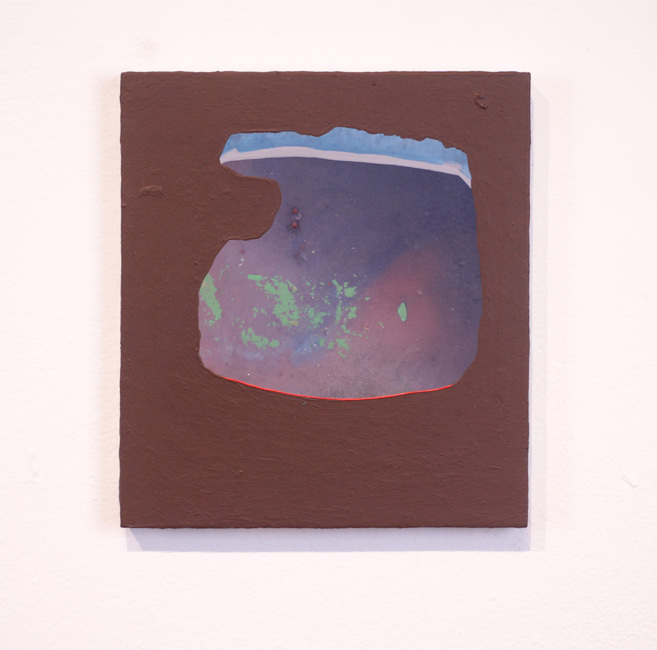 featured a selection of individual and collaborative works by Adam Lovitz and Patrick Maguire. 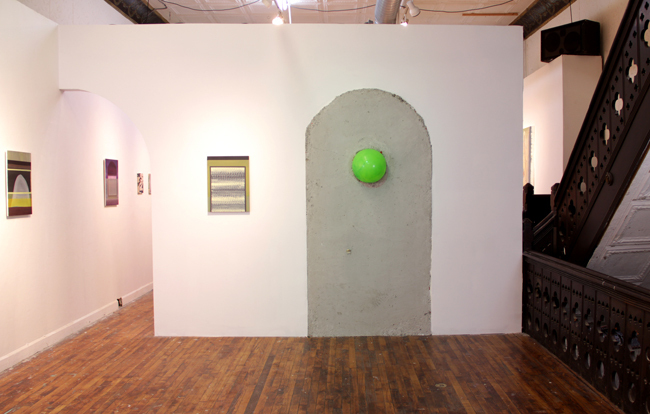 From the title of the show to its careful curation (including artist-built sectional walls within the gallery space), the result was an immersive landscape, a casual yet careful conversation between two artists, deftly exploring and questioning the possibilities of an imagined and material beyond. Maguire’s fastidious, delirious abstract oil paintings teeter between the identifiable and the completely elusive, referencing openings, views, landscapes, and architecture. Their finely crafted, repetitious mark making simultaneously conjures digital time code or static screens, and more fundamental patterning – like Martin Ramirez’s art-deco undulations, and pre-perspectival visions of space. 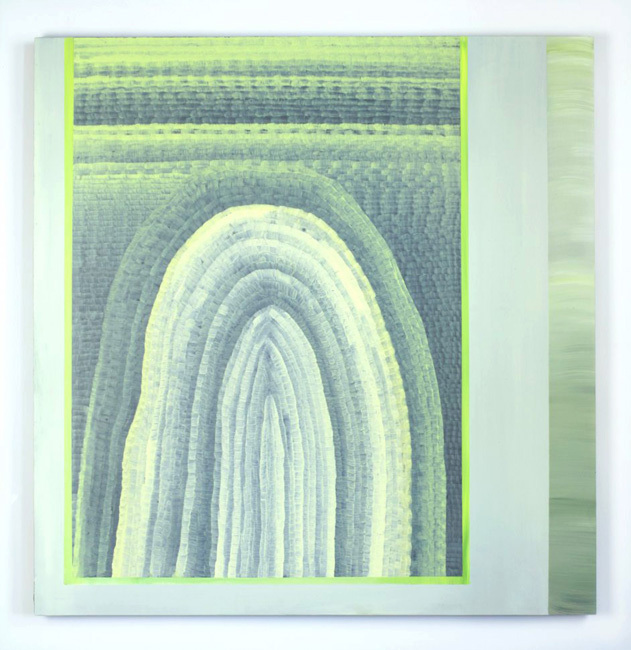 The paintings’ curious balancing act leaves the viewer destabilized yet enthralled, like the effects of lucid dreaming, or the ocular afterglow that follows exposure to extreme light. In Eye Shut Spectrum Sprawl, a dazzling modulation of acid green and blue/grey passageways flit backwards and forwards through the picture plane, creating a veritable hologram that is steadied, stunted back to reality by its flat, even border. In First Glance Morning Rise, a window is simultaneously a mountain, a sky, and a screen. Again the dreamscape ticks off possibilities, unfettered by mandates, a kind of austere surrealism for our new, screen-based age. 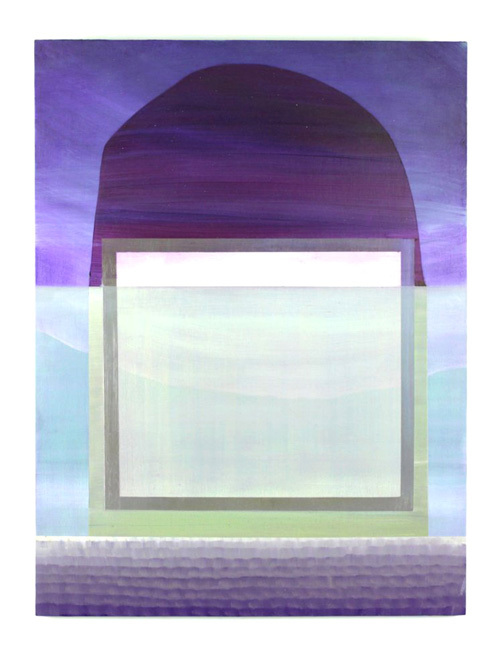 The minute dimensions of Adam Lovitz’s thoughtful, meandering acrylic paintings belie the multitudes they contain. These small ruminations on color, space, texture, and perspective offer different vantage points into the seeable and knowable, chopping the world into moments and tenderly offering those moments like a cat might a mangled, twitching mouse. Lovitz’ paintings simulate the experience of bobbing up and down in a pool, capturing what you might see in the interstitial milliseconds when your head surfaces above water. Their feeling is not one of heaviness or the accretion of paint, but of passages, layers moving past one another, cosmos conspiring just for that moment – what you might happen to see, if only… Mud Wisdom, a small painting on wood panel, features a frame of flat, drab, matte, muddy brown, encircling what appears to be a glimpse into a terrestrial – or celestial – beyond, teeming with activity. Is it being engulfed? Is it breaking through? It is as if only the painting, the mud itself, can know. The collaborative installation pieces offer a nice moment of conversation, where the artists’ two visions meet for a chat, or joke, or dance. 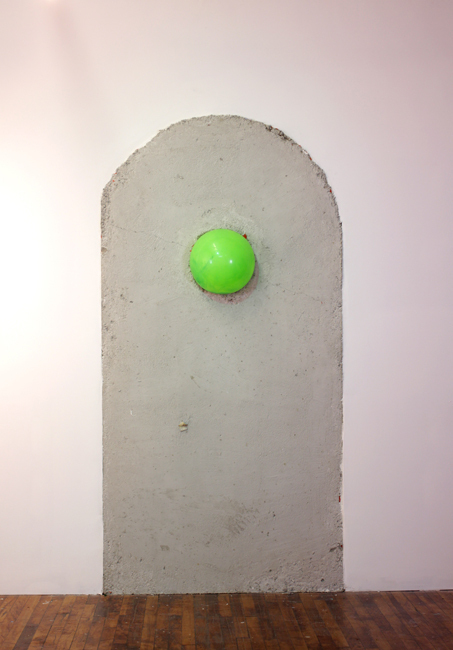 In Crack Pop, a glowing green orb protrudes from a rough wall, and casts a sickly pink shadow. Is the shadow paint? Light? Something else? Or am I the only one seeing this? 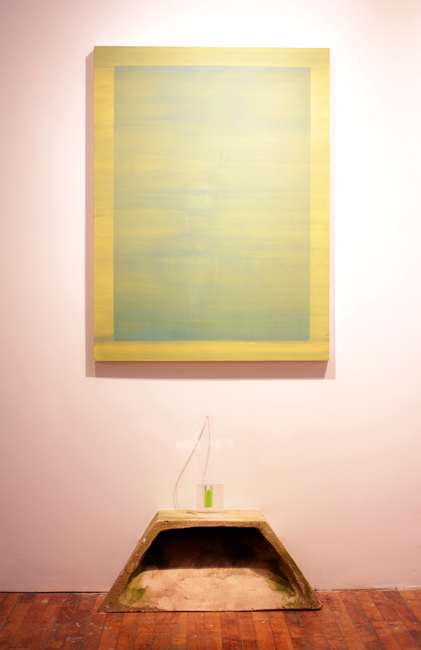 In another, untitled, a bubbling beaker sits below a painting, brimming with neon liquid, fed from a tube within the wall. Somehow this follows the exhibitions’ self-made reasoning, a perfectly logical place for a perfectly useless substance. These works do not convince, posture, or make believe, like so much work that takes on epic matters of the eternal, the celestial, the terrestrial. Instead they are like koans – a paradox to be meditated on – expressing both great doubt and great hope. Kaitlin Pomerantz is an artist and educator in Philadelphia.